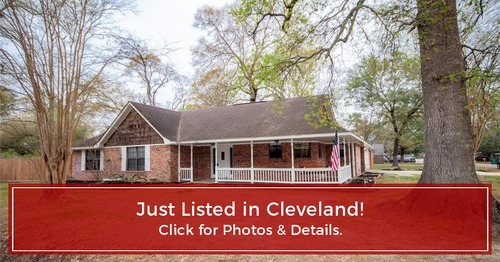 Charming Victorian style one story home situated on double corner lot in the heart of Cleveland. Great curb appeal with this porch! This home has laminate wood flooring throughout main areas and bedrooms – no carpet! Spacious family room with beautiful stone fireplace! Front kitchen includes a large breakfast bar, movable island, double ovens, electric cook top, pantry and tons of cabinets for storage; dining room with triple bay windows with beautiful trim; master bedroom with private bath with vanity area, linen storage and walk in closet; two secondary bedrooms and large second full bath; detached garage with covered breezeway area is perfect for BBQ spot. Fully fenced back yard has plenty of room for the kids (big and little), pets and a pool if you would like one! NO RESTRICTIONS! Low taxes and home is move in ready! We are looking for a new owner!